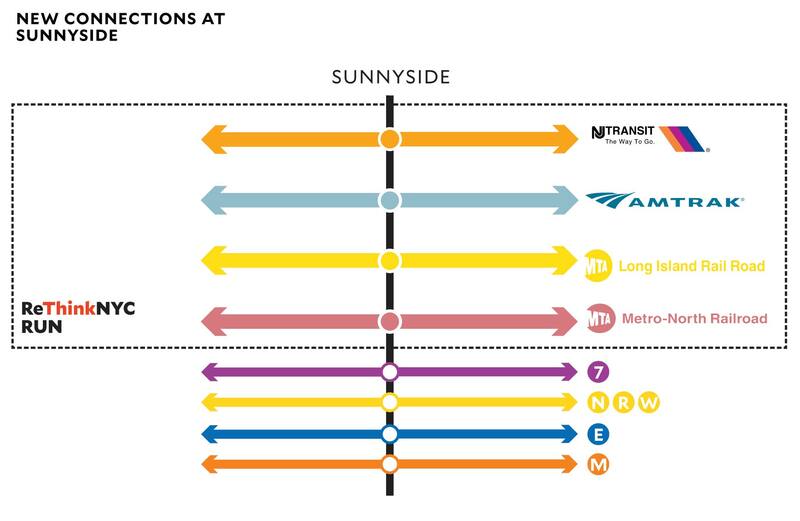 Sunnyside Station will be the cor­ner­stone of a larg­er plan to trans­form the neigh­bor­hood into a new high‐den­sity office dis­trict. The sta­tion will be ser­viced by long‐dis­tance and com­muter rail, sub­way and local bus­es. By mov­ing Sunnyside’s rai­l­yard to the Bronx, it will be pos­si­ble to imple­ment through‐run­ning in Sunnyside and to con­struct a new 280‐acre Central Park in Queens around the sta­tion. The park, the tran­sit hub, and rezon­ing will spur the devel­op­ment of res­i­den­tial and office space in the sur­round­ing neigh­bor­hood. The modified Secaucus Station will offer free transfers between Amtrak long‐distance rail, commuter rail, the NYC Subway, PATH, as well as local and regional bus routes. 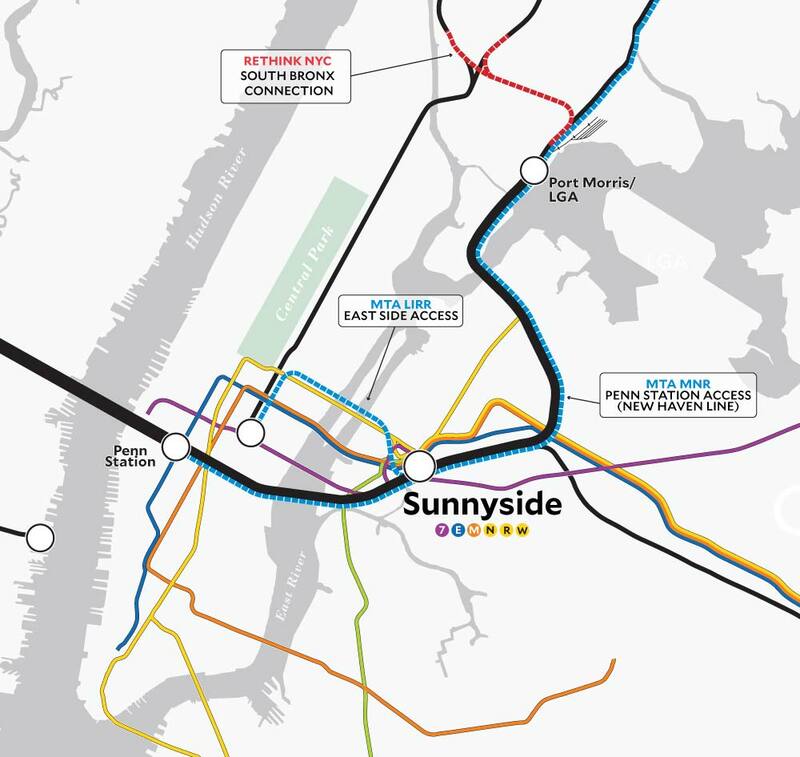 Additionally, the station could be connected to an expanded light rail network that will link to Jersey City, Newark, and the surrounding communities. The question of redeveloping Sunnyside Yards has plagued New York City for almost a century. A 2017 study by the New York City Economic Development Corporation quantified the challenge posed by the site: It would cost $17–19 billion to deck over the yards, and the orientation and size of the required decking would make it extremely difficult to construct large buildings at the site. Rather than spend nearly $20 billion trying to work around the limits imposed by the site, ReThinkNYC would spend a fraction of that amount to build a major transit hub adjacent to Queens Plaza, redo the track layout and interlockings, and move Sunnyside Yards – other than Amtrak’s loop tracks – to Port Morris. By doing so, RUN removes the need for expensive decking, provides major new amenities to all of Western Queens, and better serves the Downtown Queens Business District.